The Vintage Jazz Big Band was formed in Göteborg, Sweden, in 1986. 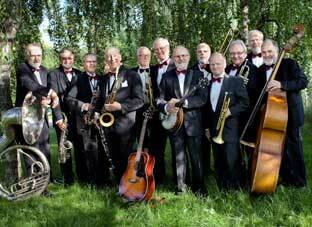 We had all been playing in various traditional jazz bands for many years and all had an interest in the big band music from the late twenties and early thirties. One main problem was to get hold of written arrangements. Vintage jazz - as played by bands like Bennie Moten, Louis Russel, Fletcher Henderson, and Duke Ellington - is available on records, but the music score (if there was one in the first place) is most often not available. Trumpet player Rolf Sundby took on the heavy task of transcribing and arranging most of the music for the band. Several classic vintage jazz arrangements were transcribed from records. In many cases, additions and alterations were made in true vintage style - for instance to feature a soloist - and therefore some of the arrangements are not to be regarded as pure transcriptions. In recent years, trombone player Magnus Bylund and saxophonist Johnny Korner also have contributed some arrangements. We also listen a lot to Kustbandet, a similar band from Stockholm, which has been playing vintage jazz since the early sixties. We even play some arrangements written by the leader of Kustbandet, trumpet player Bent Persson. Vintage Jazz Big Band plays music both for listening and dancing pleasure. The repertoire even contains some dance numbers from the good old days and also some original compositions by Rolf Sundby.